Victoria Cottage was built in the 19th century and used at one time as the brew house for The Golden Ball Inn which is adjacent. It has been fully modernised to provide 21st century standards of comfort and convenience, at all seasons of the year. It is found in a lovely idyllic backwater of Ironbridge with beautiful treetop views over the Gorge yet only a ten-minute walk to the historic iron bridge & with easy access to the local amenities & attractions in the local area. Victoria Cottage is a beautiful traditional cottage which bags of character and a real treat to spend time and relax in.... traditional but all your modern comforts to hand! The cottage has all linen & towels supplied for guests. Lounge/dining room with WiFi router & access code, TV, Freesat box, DVD player, sofa bed & arm chair. There is a fold away dining table with four chairs available. In the under stairs cupboard there is a high chair & fireguard should guest require them. Beautifully Renovated Kitchen with oven, hob, washing machine, microwave, coffee machine & all kitchen cutlery, crockery & equipment that you may need for your stay. Downstairs bathroom with pedestal wash basin, toilet & roll top bath with shower over. Combi Gas central heating boiler with full central heating throughout the property & hot water on demand. Double bedroom with double bed, wardrobe, chair, towel rail, chest of draws & side tables. Single bedroom with single bed, side table & built in wardrobe. There is a travel cot stored in the single bedroom should guests need it. Outside there is a gated patio area off the back door, ideal for a glass of wine of an evening! That's me in the middle with my daughter and friend (and her dog) who had a great holiday to the cottage (behind us) at New Year. I purchased the cottage from a gentlemen who had been running Victoria Cottage as a holiday home for 17 years. It is situated in a pretty special location (as you'll see) so after moving from Perth, Scotland to Telford I fell in love with Ironbridge. Purchasing the holiday cottage has been a great way to integrate into the local community and I can't emphasise enough the charm and uniqueness of staying at the Victoria Cottage. The cottage was bought because it is exactly the kind of cottage in which I would be delighted to spend a holiday - cosy, well modernised, in a quiet area close to the centre of Ironbridge with some great walking on the doorstep and right next door to a superb pub serving great food. I’ve run the holiday home for a few months now & my philosophy of a "would I be happy to stay here" test has always been my guiding principle. My aim has always been to provide visitors with a comfortable home from home as a base from which to enjoy a great holiday in this beautiful part of the country. Victoria Cottage is situated right in the heart of this UNESCO World Heritage Village. The world's first iron bridge is less than 10 minutes’ walk away and the 10 museums, which attract visitors year-round from all over the world, are within very easy reach. If walking is your pleasure the Ironbridge Gorge will be your delight; if you prefer to relax and take it easy, you will appreciate the Golden Ball Inn next to the cottage, which has a history a history dating back almost 300 years, the pub has a great atmosphere and serves superb food. Toilet, cupboard, mirrors, pedestal wash basin, roll top bath with overhead shower. There is also a shower head at the taps. All bed linen is provided and additional throws. There is free parking just beyond on the left or in the Golden Ball Car Park beyond the cottage on the left. wifi code by router behind the sofa. Lovely comfortable sitting room with sofa/armchairs with working real flame gas fire. (There is a double sofa bed). Tasimmo coffee maker, we will leave some pods but if you like your coffee please bring more! All crockery you will need. Beautiful Kitchen with Solid Oak Work Surface and all mod cons. There is a folding table in the sitting room with 2 chairs out, there are an additional 2 chairs under the stairs. Free sat TV with a good variety of channels. There are a variety of board games in the living room. There are a variety of DVDs in the living room. There are up to 10 museums covering all aspects of the Industrial Revolution and much more. It was our first time booking through homeaway, so wasn’t sure what to expect, but we loved it. A gorgeous cottage with everything you need. Right next to a lovely pub, but still sooo peaceful! A nice distance walk into Ironbridge. The cottage was perfect for what we needed. Short taxi ride away from the International Center. Was such a lovely place to stay and Racheal was so helpful if we needed to know anything at all. 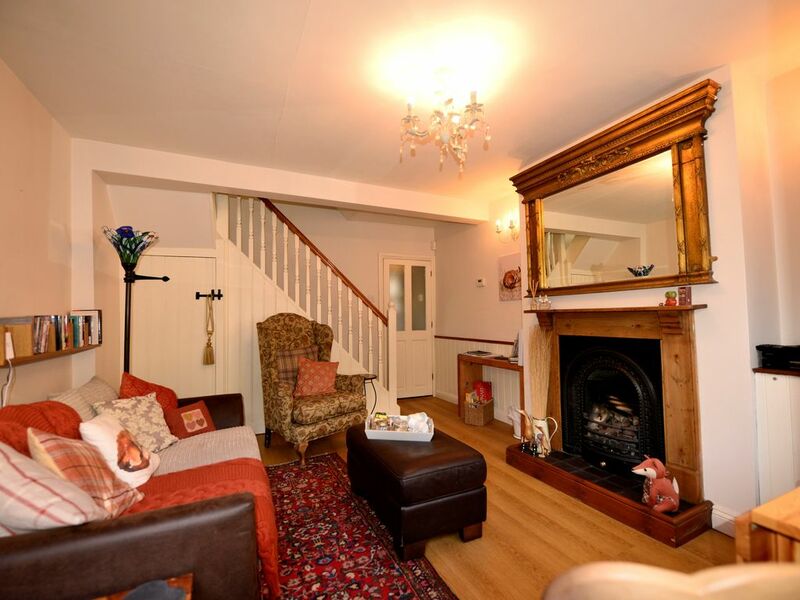 Very cosy, very well presented cottage with everything we needed for a long weekend break. Cottage is ideally located in a very picturesque, quiet part of town with wonderful views whilst still being just a short walk from all the attractions of the Ironbridge Gorge. Pub next door, The Golden Ball is dog friendly and offers many Gluten Free options (a must for a coeliac!). many, many wonderful walks from the cottage wher walking guides and maps were provided. All in all a great stay and we're sure to be back. Lovely little property with all mod cons and a great central location. Plenty of walking from the front door so perfect if you have dogs. Golden Balls pub v. good and again v. convenient if you have dogs. If you're looking for privacy this is for you - so often now these places are on the owners land which is very restrictive but we were left to our own devices. Ironbridge is beautiful and the surrounding area gives a fantastic taste of a bygone era (unfortunately). We had a very comfortable stay, and would recommend the cottage to anyone wanting to visit Ironbridge. Thankyou Rachel for welcoming us.